If the project is fully funded, UC Santa Cruz, which has some of the world's leading genomics experts, will hold a special bioinformatics class in which a select group of graduate students and a few highly motivated undergraduates will peer deeply into the genetic makeup of a slimy creature that embodies the campus's creative and countercultural mindset. The project has an obvious whimsical, crowd-pleasing aspect. After all, the genome mapping effort focuses on a mascot that has embodied UC Santa Cruz's eccentric and defiant spirit for the past 27 years, when the slug defeated the sea lion in a bid to represent the campus. But it's also serious science. "This means we can learn a lot about the biology of banana slugs," said Richard "Ed" Green, assistant professor in biomolecular engineering at UC Santa Cruz and an internationally recognized genomics expert. "This would be a great opportunity for students to learn the technology of getting DNA, turning it into a sequencing library, and using a computer to assemble the complete genome sequence." The banana slug would be the first terrestrial slug to have its genome mapped, said Jan Leonard, research associate at the UC Santa Cruz Institute of Marine Sciences and a renowned banana slug expert. "I'm really excited about this," Leonard said. "We have this random little animal as a mascot, but by doing its genome you are getting a real opportunity to advance our understanding of evolution by comparing it to closely related species." Eight species of banana slug can be found between Alaska and San Diego, but the genome project will focus specifically on the species that resides in the forests of UC Santa Cruz and environs: Ariolimax dolichophallus. If the crowdfunding project succeeds, Ed Green and UC Santa Cruz professor of biomolecular engineering Kevin Karplus will teach the class together. Karplus said the genome mapping is a great teaching opportunity for budding researchers and young scientists because "this is something no one else is doing. It is uncharted territory because there isn't a known answer. We are doing it for real in class and not as an exercise." 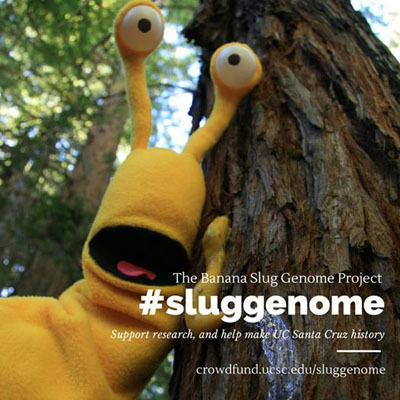 The banana slug genome class has been held before, but Karplus said that it was run "on a shoestring" and there simply wasn't enough funding or resources, so the class ended up yielding "snippets" instead of a full genome. If all goes well, a "draft" version of the genome could be ready as early as this coming spring, Karplus said. The project is long overdue, considering all other mascots in the University of California system have had their genomes mapped or are in the process, said Branwyn Wagman (Kresge '79), director of development and communications for the UC Santa Cruz Genomics Institute. Wagman said the crowdfunding project grew out of a discussion she and some colleagues had during the annual DNA Day and Double Helix Dance on campus in 2013, which included an on-campus science party and 46 dancers performing a loose visual representation of DNA. Wagman had been hoping to have a poster showing the genome of the banana slug in time for DNA Day. She was joking around about this with her husband, Ken Wagman (Stevenson '78), "and he just seized on it," she recalled. "He asked how much it would cost. We figured we could fund some of it ourselves and get our friends to kick in the rest. And then I thought: why limit this to my friends? Let's get everybody involved." The Wagmans started the crowdfunding project by offering $5,000. Two other donors -- Leslie Grate, who has a Ph.D. in computer engineering from UC Santa Cruz, and his wife, Lou, a past staff member in the UC Santa Cruz molecular, cellular and developmental biology department and a current lab volunteer in Molecular, Cell, and Developmental Biology, stepped forward to pledge an additional $7,500. This quartet of donors is matching all donations two to one. This means that supporters can put this project ‘over the top’ if they can raise an additional $6,250. Aside from advancing science, the Wagmans hope to attract more attention to the UC Santa Cruz Genomics Institute. For information or to contribute, visit Crowdfund UC Santa Cruz.